Laptops don’t explode much. When they do, it’s usually rather on the spectacular side. 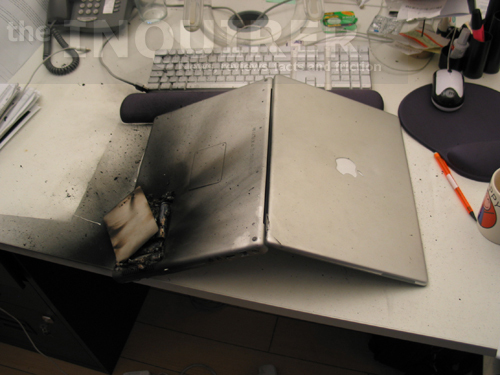 Rather spectacular, therefore, were the scenes in the London office of an unnamed marketing company the other day, when an Apple Powerbook went KABOOM. First, it started smoking, and the laptop’s user called the IT manager. It stopped, and he picked it up, but when he put it back down again it suddenly went BANG, caught fire and started shooting sparks everywhere. After evacuating the office, he returned to the laptop to find six-foot flames shooting out of it. He hit the fire alarm, and legged it. After a fire marshall showed up, he used most of a fire extinguisher on the burning wreck, which calmed it down temporarily, but as soon as he stopped, it started flaming again, just as vigorously as before, with the inside red hot and glowing. They then waited for the fire department to show up. Apple is checking the serial number to see whether it was part of the series whose batteries were recalled a few years back. If not, it could prompt another recall, but it’s just as well that this was in an office. In an empty flat, or a car or plane, things could have been a lot worse. 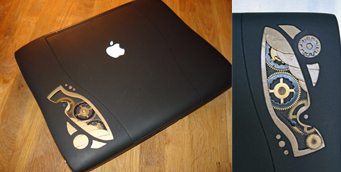 Now that you know the, err, inner workings of the design aesthetics of steampunk pieces, here’s hoping you will appreciate the work that’s gone into this steampunk Pismo Powerbook created by Mr. Mordasky over at Mac Mod. Using just broken clock parts purchased on eBay, aluminium sheet metal, gloss, and a bit of bronze paint, he has designed and made all by himself the perfect black steampunk Powerbook…. Girls! Destroying Apple laptops! In bikinis! BEST. DAY. EVER!? She may be a Powerbook-toting jailbird, but at least Paris Hilton knows the way to earn big bucks – product placement all the way, baaaaby. That’s hot, as she’d slur.